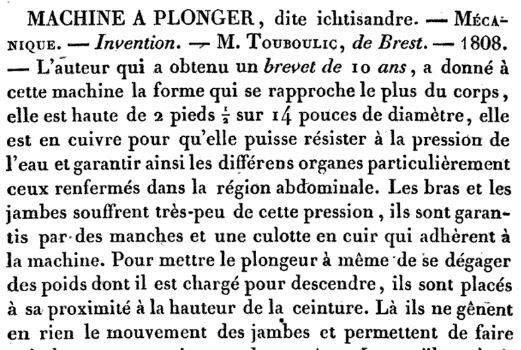 On June 17th, 1808, Sir Touboulic, a mechanic in Napoleon’s Imperial Navy filed a patent for a diving machine. There is no evidence of any prototype built and test conducted. The invention he called the “Ichtisandre” was a copper jacket resembling the one of a barrel covering the torso and head while arms and legs were in leather sleeves. Oxygen was stored in a bladder and equipped with a valve leading to the main jacket. The machine was weighted to go down but it could be separated to come up or in the case of an emergency.